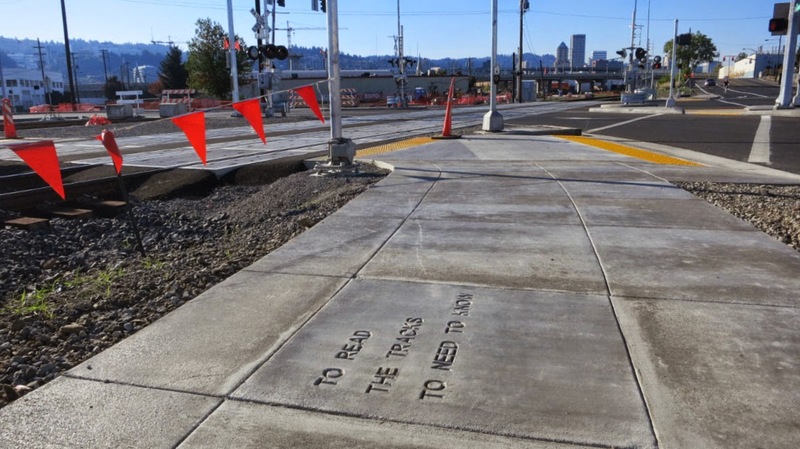 Sidewalks have been going in along the new light rail line for the past few months. Here are some new photos of stamps. 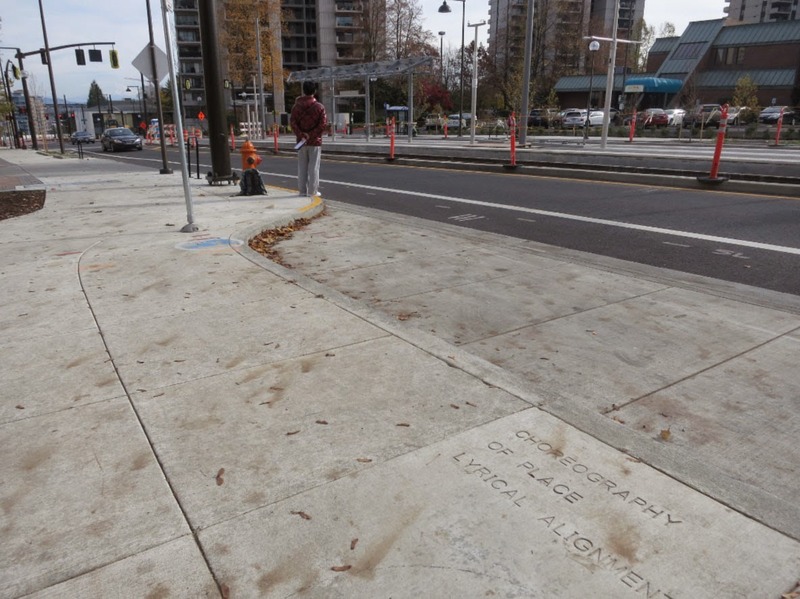 Some of them are still in construction zones, so are not quite accessible to the public yet. I’ll post them in this order: from PSU (SW Lincoln and 5th) traveling east on Lincoln to SW Naito, then across the river to the east side, and heading south from there. “STEEL CABLES SOLDER THE SKY TO STAINED GLASS”, written by Ayelet Amittay. Located on SW Lincoln, south side of the street, at SW 5th. 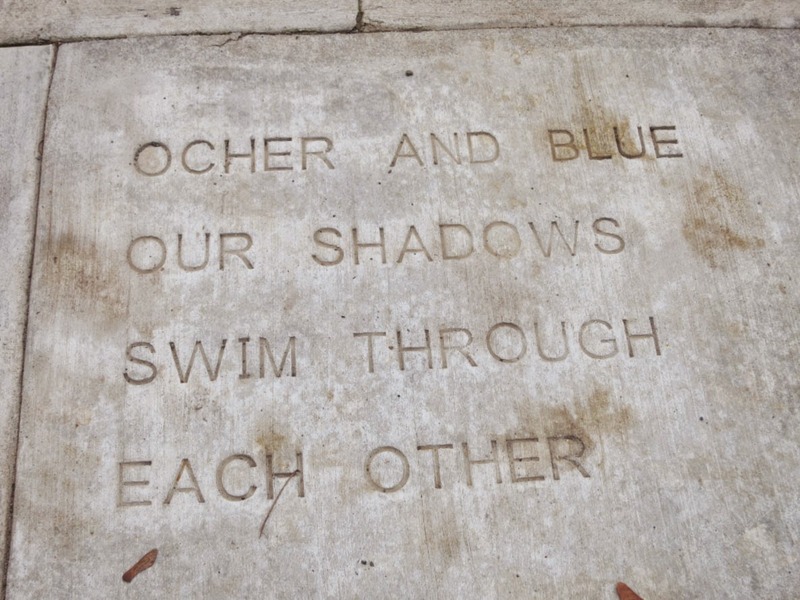 “OCHER AND BLUE OUR SHADOWS SWIM THROUGH EACH OTHER”, written by Margaret Thomas. 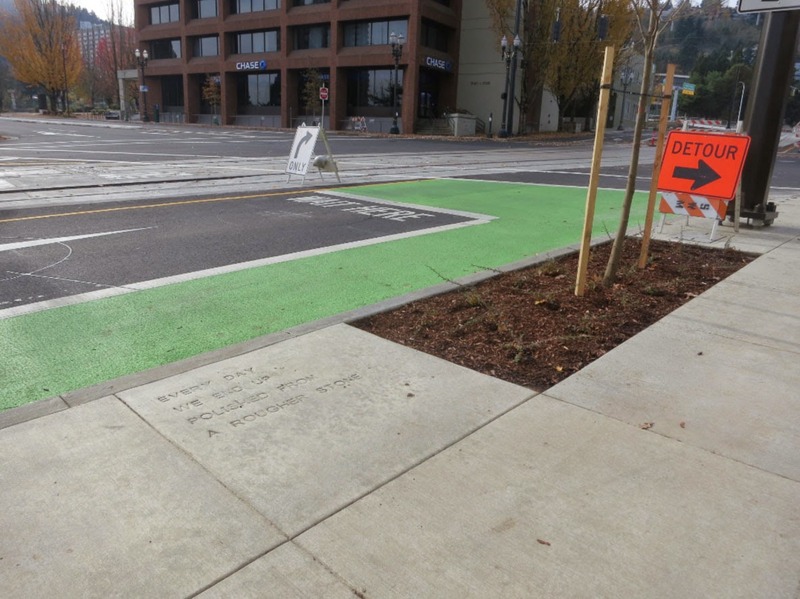 Located on SW Lincoln, north side of street, at SW 4th. 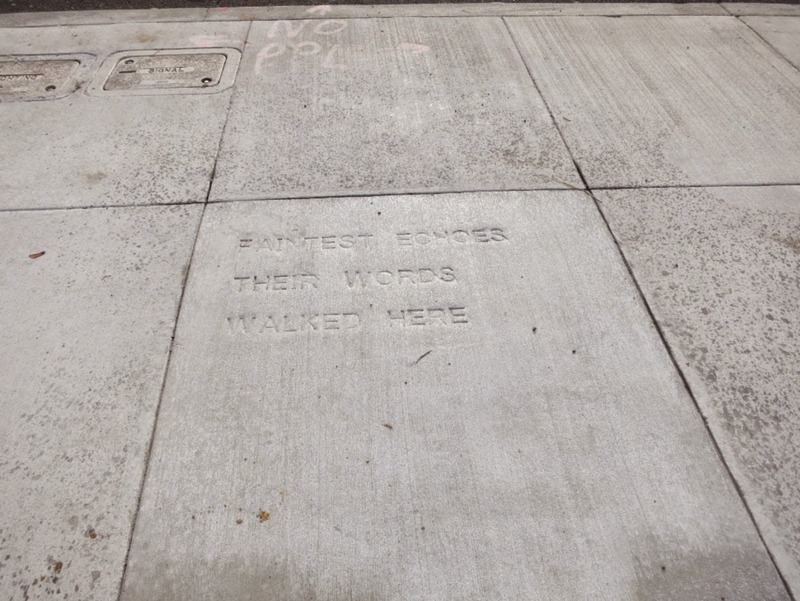 “FAINTEST ECHOES THEIR WORDS WALKED HERE”, written by David Abel. Located on SW Lincoln, north side of street, near SW 4th. “EVERY DAY WE END UP POLISHED FROM A ROUGHER STONE”, written by Amy Schutzer. Located on SW Lincoln, north side of street, near SW 4th. “CHOREOGRAPHY OF PLACE LYRICAL ALIGNMENT”, written by Peg Butler. Located on SW Lincoln, north side of street, between SW 4th and SW 1st. “WE ARRIVE TOGETHER”, written by Elisabeth Tschalaer. Located between SW 4th and SW 1st on SW Lincoln, south side of the street. “ON TRAINS WE STAND SHOULDER TO SHOULDER”, written by M. Located Between SW 4th and SW 1st on SW Lincoln, north side of the street. 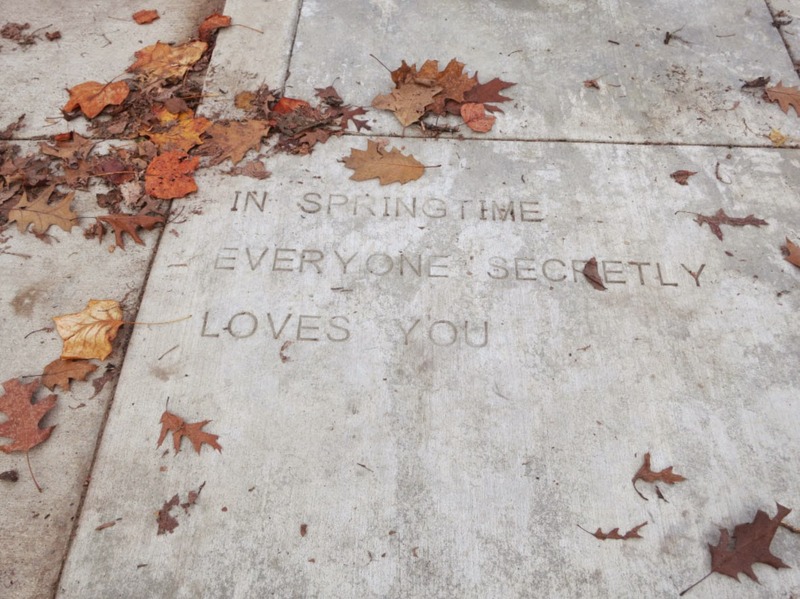 “IN SPRINGTIME EVERYONE SECRETLY LOVES YOU”, written by Scot Siegel. Located on the south side of SW Lincoln at SW 1st. 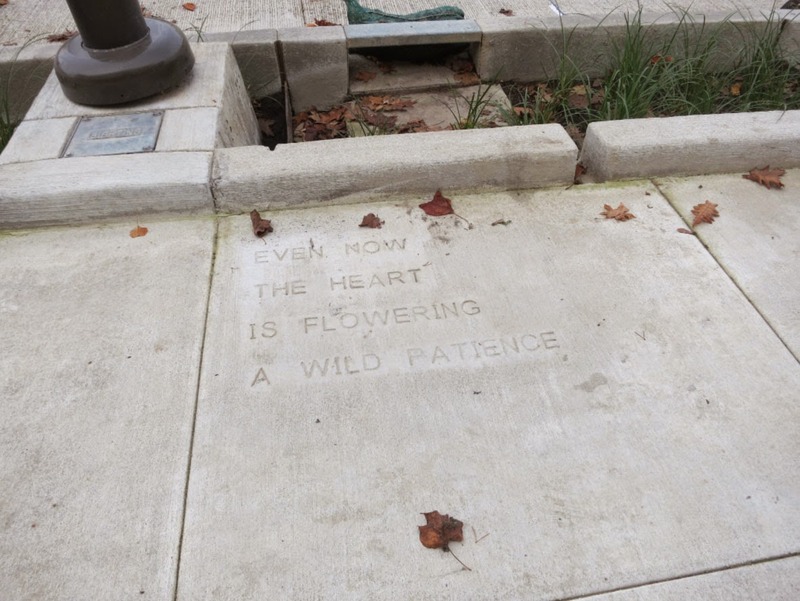 “EVEN NOW THE HEART IS FLOWERING A WILD PATIENCE”, written by Amy Schutzer. 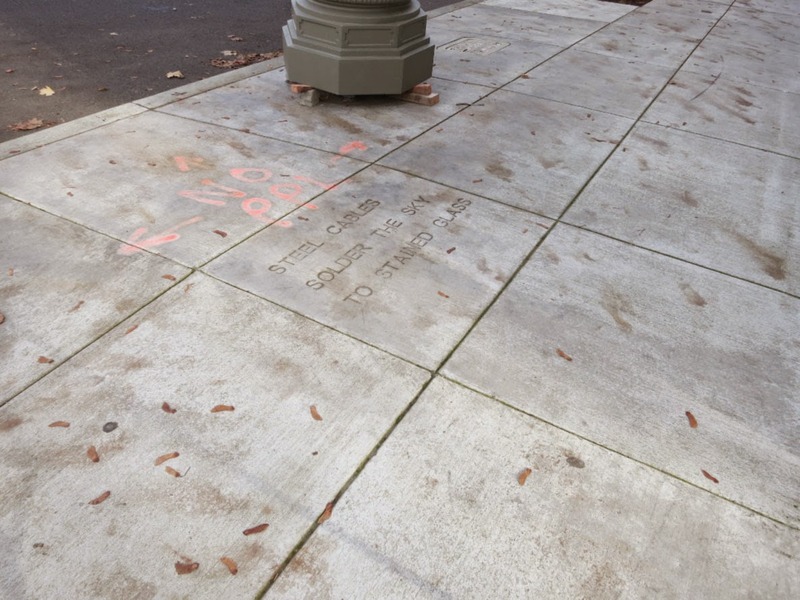 Located on the south side of SW Lincoln between SW 1st and SW Naito. 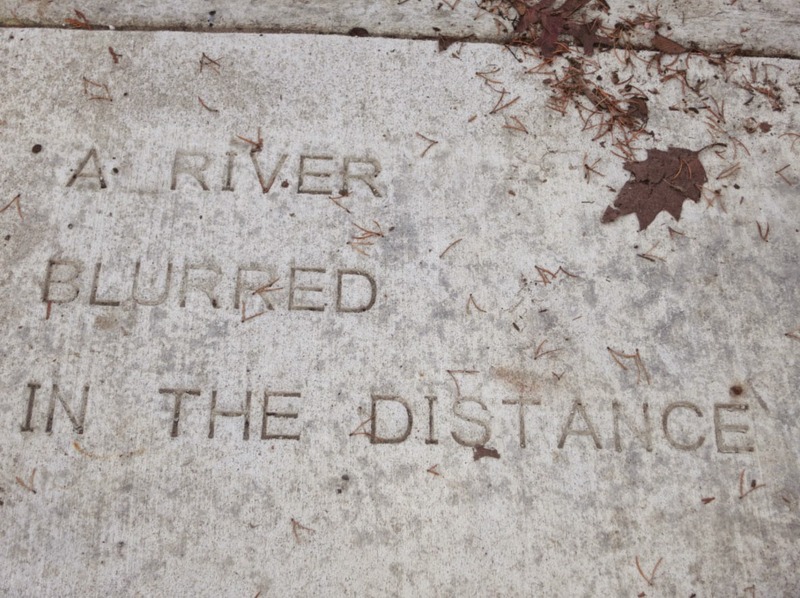 “A RIVER BLURRED IN THE DISTANCE”, written by Anne Elizabeth Shaw. 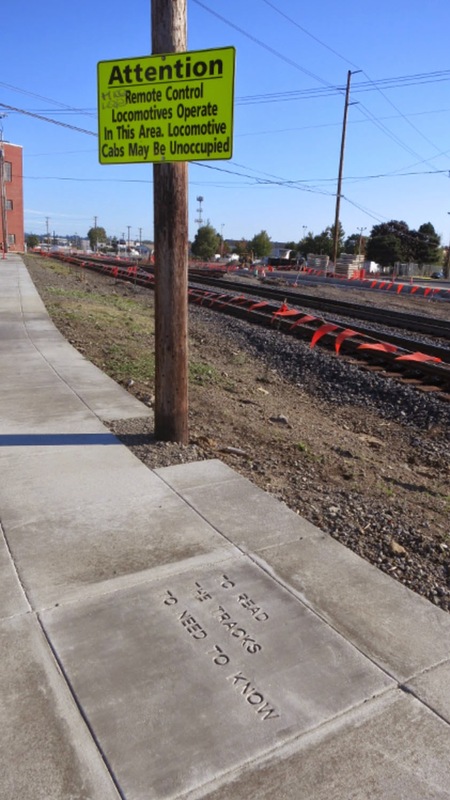 Located on the south side of SW Lincoln near SW Naito. “BEHIND THE VEIL OF MORNING CLOUDS MT HOOD”, written by Margaret Chula. 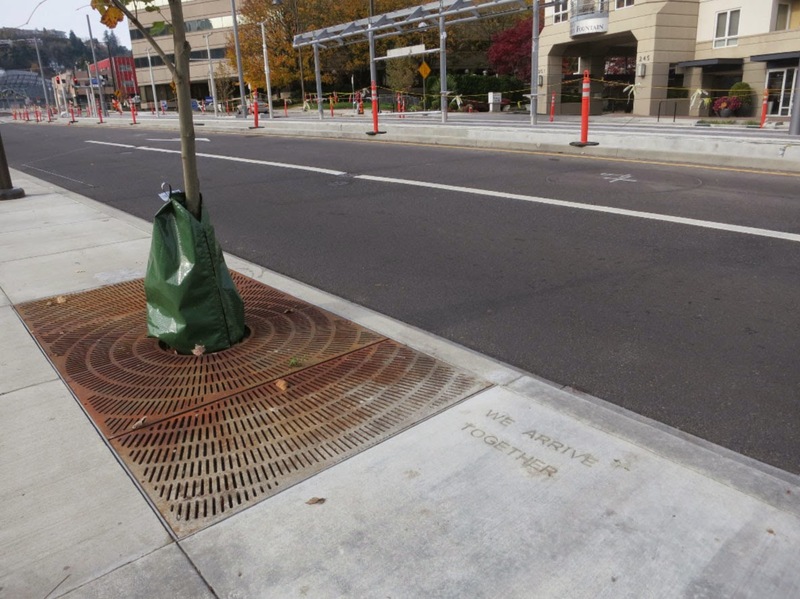 Located on SW Naito at SW Lincoln, west side of the street. Now over to the east side of the River. "TO READ THE TRACKS TO NEED TO KNOW”, written by David Abel. 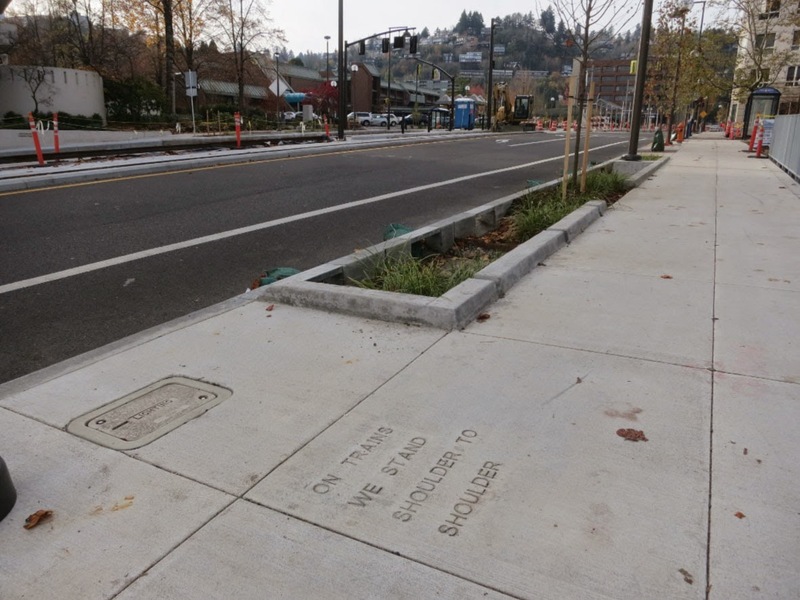 Located on SE Division St at SE 8th, south side of the street. 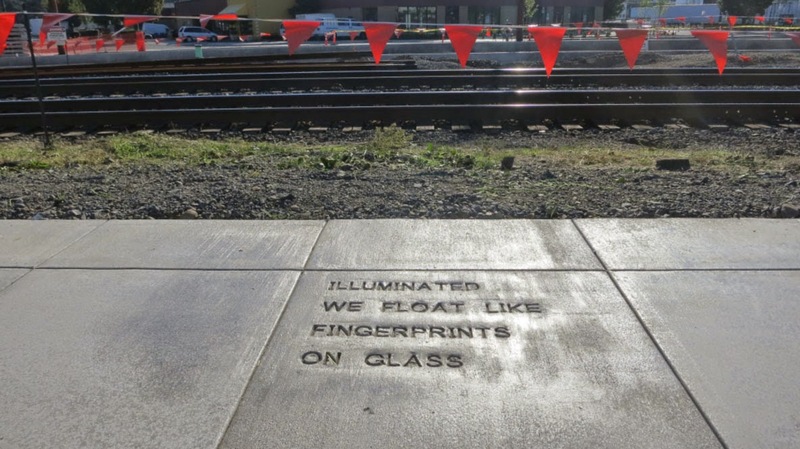 "ILLUMINATED WE FLOAT LIKE FINGERPRINTS ON GLASS”, written by Brigitte Goetze. 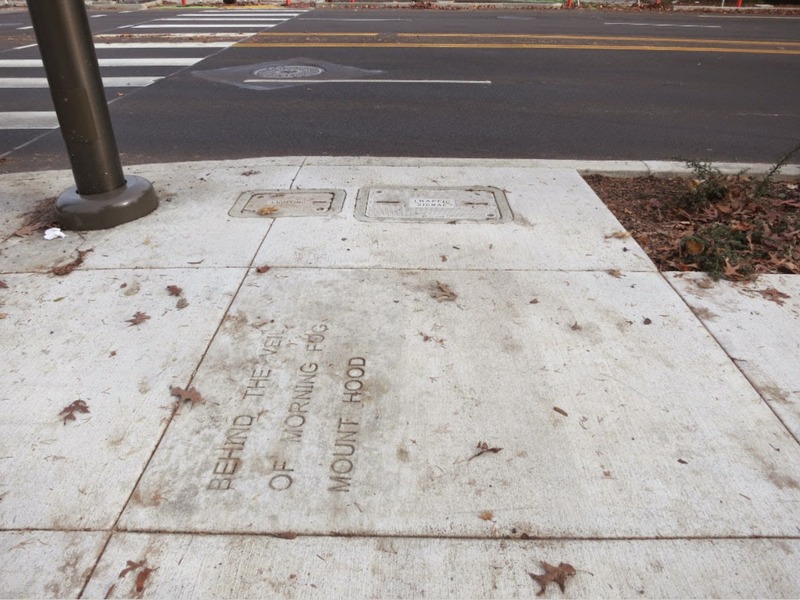 Located on the south side of SE Division at SE 8th. 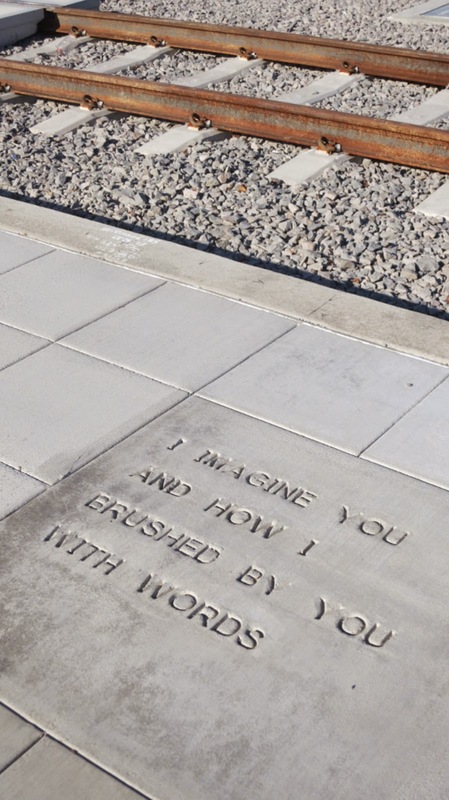 “I IMAGINE YOU AND HOW I BRUSHED BY YOU WITH WORDS”, written by Elisabeth Tschalaer. Located on SE McLoughlin at SE Gideon. “HER FACE AS SHE TURNS FROM THE WINDOW”, written by Anne Elizabeth Shaw. Located on SE 17th Ave and SE Haig, east side of the street. 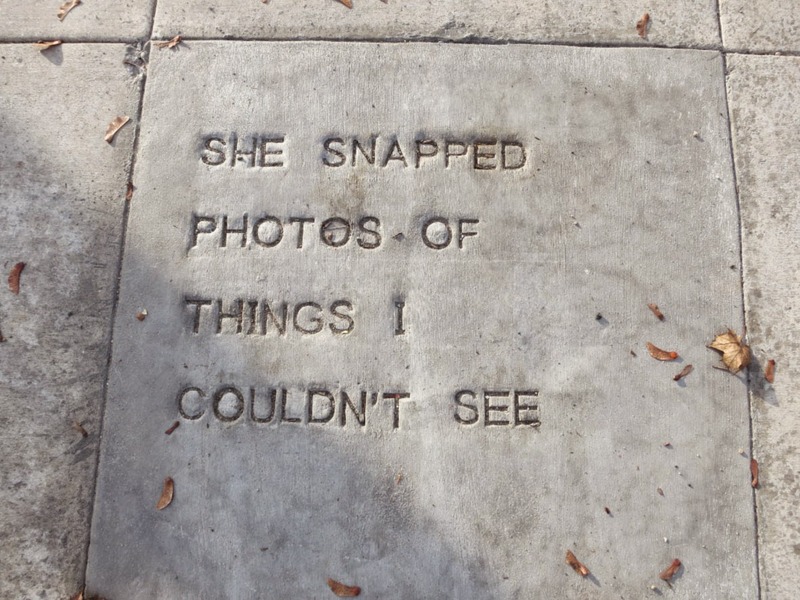 “SHE SNAPPED PHOTOS OF THINGS I COULDN’T SEE”, written by Jules Boykoff. Located on SE 17th Ave at SE Rhine, west side of the street. 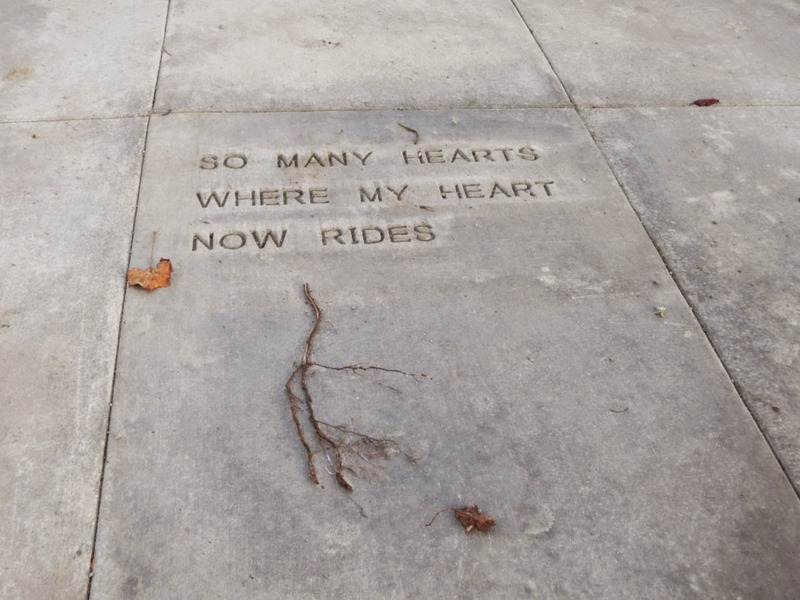 “SO MANY HEARTS WHERE MY HEARTS NOW RIDE”, written by Lana Hechtman Ayers. Located on SE 17th near SE Boise, west side of the street. 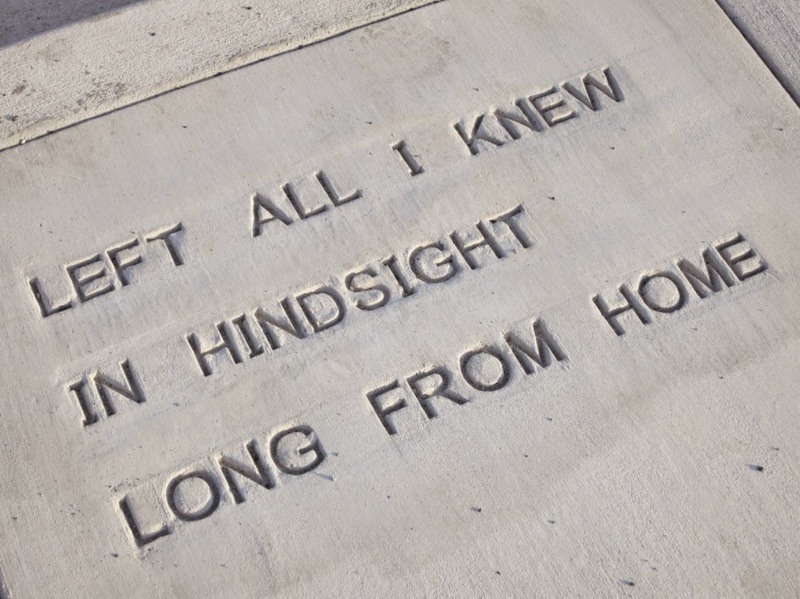 “LEFT ALL I KNEW IN HINDSIGHT LONG FROM HOME”, written by Jessica Samuelsen. 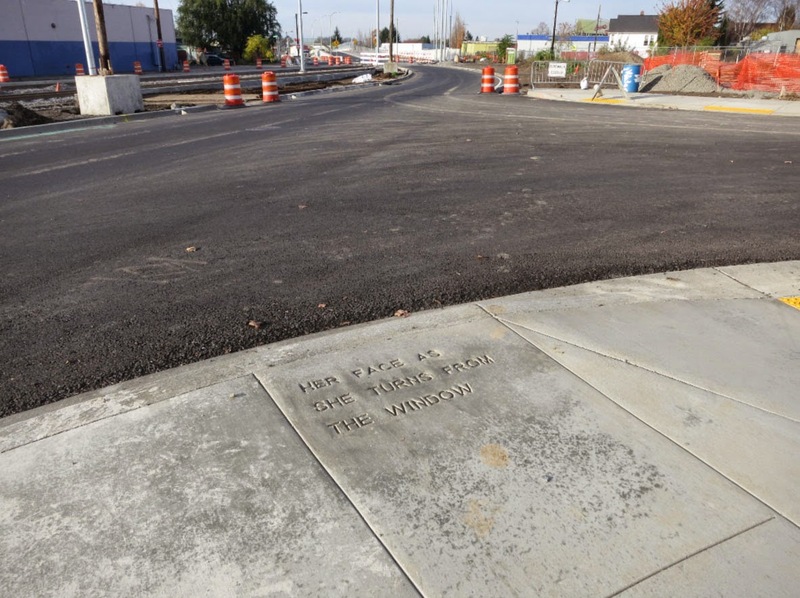 Located at SE 17th and SE Mall, west side of the street. 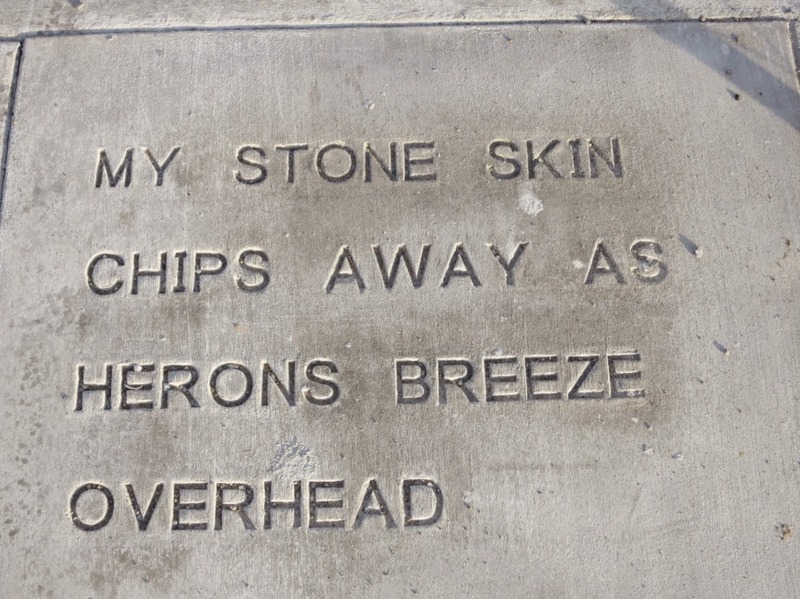 “MY STONE SKIN CHIPS AWAY AS HERONS BREEZE OVERHEAD”, written by Mike Aspros. Located on SE 17th near SE Holgate, west side of the street.